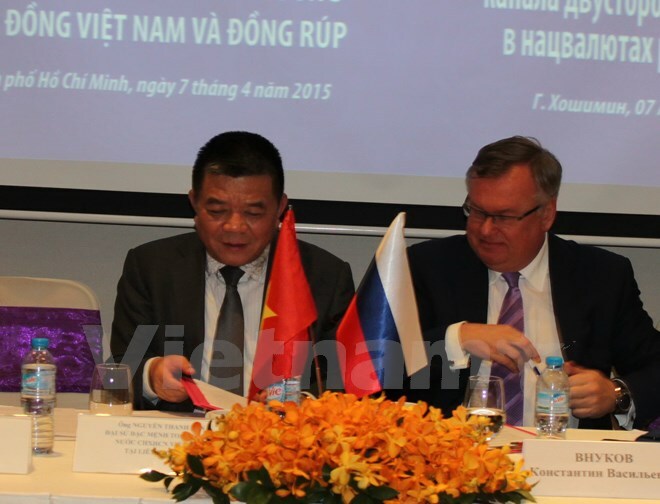 HCM CITY (VNS) — The Bank for Investment and Development of Vietnam yesterday signed a memorandum of understanding with the Bank for Foreign Trade of Russia to enhance the role and capacity, including financial, of their joint venture, Vietnam – Russia Bank (VRB). The signing ceremony was held during an ongoing visit to Viet Nam by Russian Prime Minister Dmitry Medvedev. The agreement is expected to help VRB better serve customers in the two countries, thus accelerating economic co-operation between Russia and Viet Nam. VRB will set up, if approved, a payment channel for Russian and Vietnamese businesses using their respective currencies, the dong and the ruble. The two partners will seek permission from their governments for themselves and VRB to participate in/serve key projects and bilateral programmes at the governmental level in areas including nuclear energy and defence. VRB is expected to provide services such as credit, deposit, foreign exchange, letters of credit, and others. It was established in 2006 with both parent companies holding an equal 50 percent stake. It has total assets of US$447 million and outstanding loans of $269 million.